“Dholakpur ka Sultan – Chotta Bheem” animated adventure series undoubtedly, the favorite of every kid. It’s a great source of fun and entertainment for our little ones. The little hero bheem is helpful in nature and along with his friends as a team will find solutions to problems faced by the king in the fictional kingdom Dholakpur creating a positive effect and sharing the same on children’s mind. If your little love is a fan of Bheem and his friends don’t miss the green gold store decors. Get ready to fall in love with these colorful décor ideas. These chairs are eco-friendly and are the best ergonomic furniture which prevents us from health problems related to incorrect sitting postures. These bean bags are also custom made to your specifications related to size, color, fabric and even personalization is available at a very low cost. 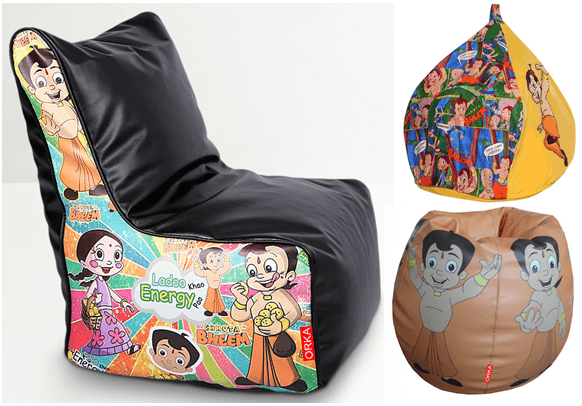 Take home any of these digital printed orange bean bag, Chotta Bheem comic cover bean bag, the multicolor digital printed bean chairs and provide a relaxed, comfortable seating arrangement for your loved ones. No room is complete without a wall clock; clocks compliment all types of decors. Theme based Bheem kids hand painted wall clocks are considered to be a style statement. Hang these colorful attention grabbers which holds a perfect combination of class, style and use. Create an attractive and interesting work station for your kids with these Chotta bheem study table and foldable writing desk. You have many colors to choose like purple, yellow, orange, pink and blue. Let them enjoy their homework’s with these crazy animated characters. Could find wide variety of dinner sets for kids in the green gold store. You will get attracted to the pretty yet useful ones like Chutki pink mug, super lock and seal snack box and serve well 3pcs dinner set. 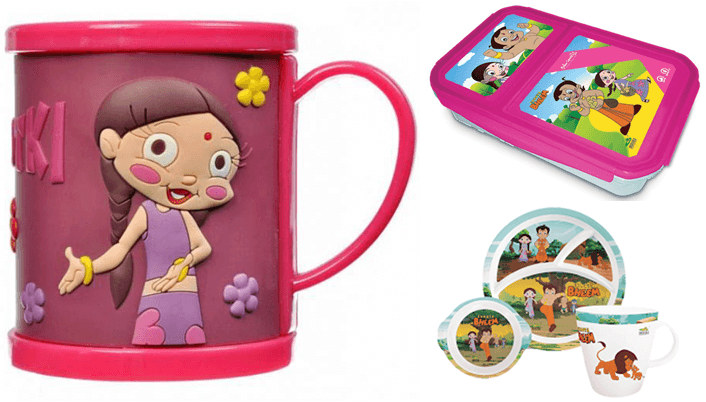 The diehard fans of bheem will never miss to enjoy their yummy time with these kids dining ranges. Decorate with these light and cuddly pillows to give lively look to the room. 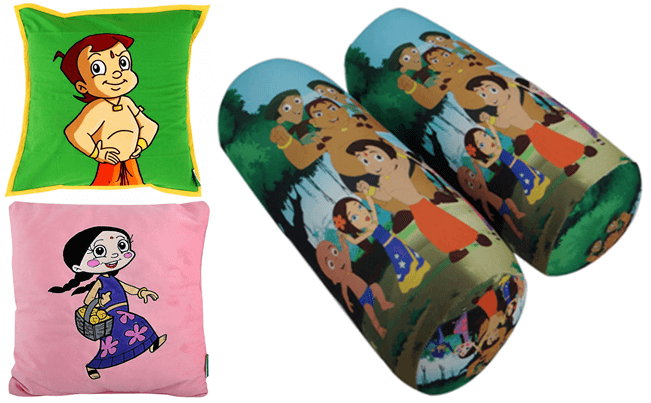 The pink Chutki and the jungle green Bheem cushions are ideal for both bed and sofa. The cylindrical bheem and friends bolster cushion is very comfortable and supportive when placed under these cushions. Unique Chotta Bheem reversible blankets, 3D bheem blankets, blue mini blankets are ultra -warm and sure to add luxurious comfy to your kids. It is breathable and maintains a comfortable temperature giving a pleasant sleep. 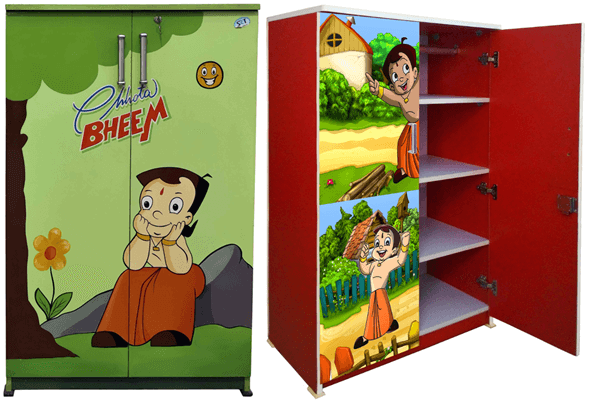 Upgrade your closet with this stunning bright kiddy Chotta Bheem armoire. The solid color of the wardrobe makes it the center of attraction and is spacious enough to keep the accessories that match multiple items in your closet. Green gold store has got endless collection of poly vinyl wall stickers. Beautify the walls with these Chotta Bheem muscles decal, floating ladoo sticker and 123 Bheem and Chutki collections. These stickers with perfect lighting to the room creates a highly dynamic space with boundless beauty. Gifting is an art, it shows your special care to the receiver. Everybody’s childhood memories include the gifts they received. 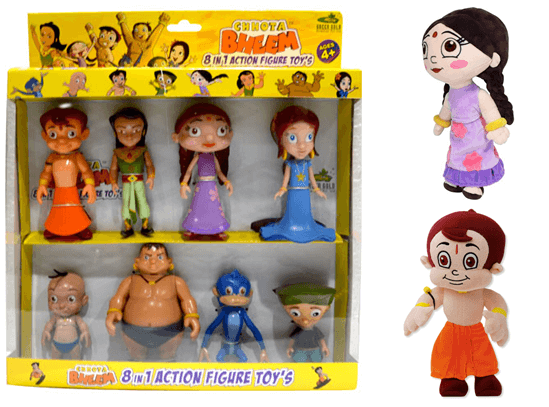 These Bheem and friends action figure toy set combo, Bheem and Chutki plush toys and lots more in the store will definitely be a memorable and treasurable gift for your cute little ones. Kids are good and quick observers, the growing minds with lots of creativity and curiosity should be fed with tons of positive thoughts. Cartoon shows or animated movies are considered as an imaginary fun land by your naughty ones. Choose positive animated series like Chotta Bheem which encourages helping, sharing, team work, problem-solving and many more qualities making your kid a good natured and talented outstanding individual in future. Create a fun filled positive learning atmosphere for your kids with these colorful sparkling animated character decors from Green Gold Store. If you come across any unique useful décor from Green gold store, please do send it to us so we can add it to our list. 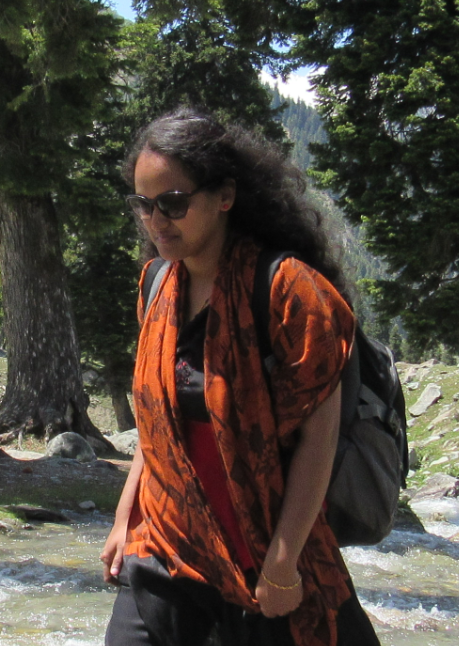 Create lasting lovable memories for your kids….. Previous story Are You Planning to get Rid of Non-Functional Stuff at Home?